So, what is the 3in! Prediction League? Basically, each player in the league chooses just three matches from the weekend’s fixture list and predicts whether they will be a home win, an away win or a draw. You score points based on how correct your three predictions turn out to be and the match odds published by William Hills. How does the scoring actually work? 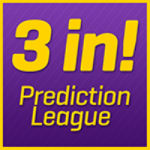 Your three predictions are entered as a Patent bet, which means you get three singles, three doubles, and a treble. So, you have seven bets in total. (If you went into a bookies and placed a £1 patent bet it would cost you £7, £1 for each bet). What you would stake and win with a real bookie with this bet, we convert to virtual money, or points, in the Prediction League. Then what? Basically, you total the decimal odds of all your winning bets and that becomes your points score for the week. The more of your three predictions you get right, the higher your win will be and so will your score. Also, if you pick matches with higher odds and predict the correct result, you will score more points. Hmmm, I’m still not really getting it! Right, here’s an example below. The fractional odds are converted to decimal – for example, the 9/4 for a Bristol City draw becomes 2.25 to which you add your virtual £1 stake, so 3.25. Do the same with the other two bets to calculate the three single bet values. The bookie calculates the odds for the three doubles and the treble but I am not sufficiently geeky to know how they do that. The table below shows what you would score if you predicted all three matches correctly; add up the 7 bet scores – 59.99 – and subtract the £7 stake to arrive at 52.99. OK, got it. So, when does it start and how long does it last? The 3in! season lasts for 20 weeks. We have two PL seasons in one regular football season, one before Christmas and one after. The weekly schedule is published on the website. Which fixtures can I choose from? Each week you will receive an email listing the fixture list. This will normally be the fixtures from the top four English leagues played on Friday, Saturday and Sunday. Sometimes, there list may also include international matches or FA Cup matches. There will be between 40 and 46 matches to choose from. How do I submit predictions? If you are predicting a win, I just need the team name exactly as it appears in the fixture list. If you are predicting a draw, I just need the home team name exactly as it appears in the fixture list plus the word “draw”. In fact, just as you can see in the examples above, with each of the three predictions on a separate line. Why do you need the team name to be exactly as it appears in the fixture list? Because, it helps me to cut and paste them directly into my system and if you give me anything different I have to start typing things manually. With almost 100 sets of predictions to deal with each week, that becomes a pain in the arse. So, just do it right, please! Do not get creative with the names of the teams or the format of the predictions submission. If it says “Tottenham” that’s what I want to see – not “Tottenham Hotspur” or “Spurs” or “Tott’ham” or “Tottenham H”. Just plain old “Tottenham” please. Can I send them via text instead? Only in an emergency, please don’t make a habit of it! There is more chance of me not missing your entry if you reply to the original email fixtures list. If you lose the email, the fixtures are always on the Next Odds page of the website. Is there a deadline by which I have to submit each week? No, not specifically. You have up until a match kicks off to predict its result so you could miss all of Saturday’s main fixture list and rely on the Sunday games. You just have to hope that there are at least three games on the Sunday or your chances of scoring big are reduced accordingly. What if a cup game goes to extra time and penalties? Bookies odds are generally based on the score at 90 minutes so we go with that. What if a game is postponed? If one or more of your three selections is postponed then your Patent bet permutations are again reduced accordingly. Again, I don’t pretend to understand exactly how the bookies calculate this but I have a formula that does it for me. Basically it means that your maximum win or loss will be reduced. If all three of your selections are postponed, you should give serious consideration to packing it all in. Can I change my predictions after I have submitted them? It’s a brave man (or woman) that does so but yes, provided the new matches you select haven’t yet kicked off you can change your mind. I will always take your latest submission – you’ll be amazed how many people send in three pcks, completely forget that have done so and the send in three completey different new ones. I never ask questions, I just take your most recent predictions in good faith. Will I receive a confirmation that you have received my predictions? Definitely not! With 90 sets of predictions to process I don’t have the time. But, if you reply to the official fixture list email and you don’t receive a failure, you can safely assume I have got it. Will you send me a reminder if I haven’t sent you any predictions? Er, what do you think? No, I won’t. You’re a grown adult, sort your life out. How much does it cost to enter? It’s £1 per week, so £20 for the season. Then we start again in January if you’re still with us. How much can I win? There are weekly prizes of £25 to the highest four score of the week – £10 to the highest scorer and three times £5 to the next three highest. The top 25 players at the end of the 20 weeks share the rest of the fund between them. 100% of entry fees are re-distributed as prizes. The breakdown of the prize fund is listed on the Diary page of the website. Do I have to pay my £20 before I can join? Yes!! No pay, no play! How can I find out how I am doing as the season progresses? Update tables and stats are published on a weekly basis on the News section of the website and you will receive an email notifying you when the updates have been made. There is also a Facebook and a WhatsApp group. Can I change the email address you send the updates to? Yes, you can unsubscribe your existing email address or add a new one here.